Welcome to this tutorial video presenting the “TRIANGLE AIO” app. Just swipe the screen from left to right to make them appear, or use the arrow on the top of the screen. Search: to quickly access the music saved on your mobile device. 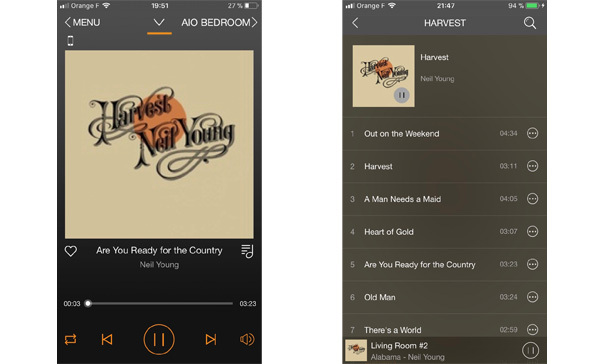 Favorites: allows you to list your favorite tracks on your mobile device. You can add a song to your favorites by clicking on the “...” icon in My Music and select “Add to Favorites”. 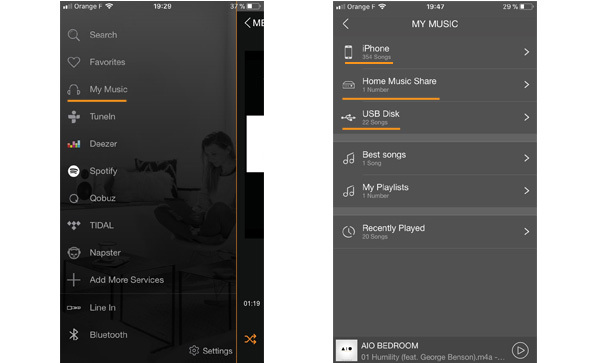 My Music: the AIO speaker allows you to play music saved on your phone, a NAS drive paired your network or on an USB drive plugged in the back of the speaker. 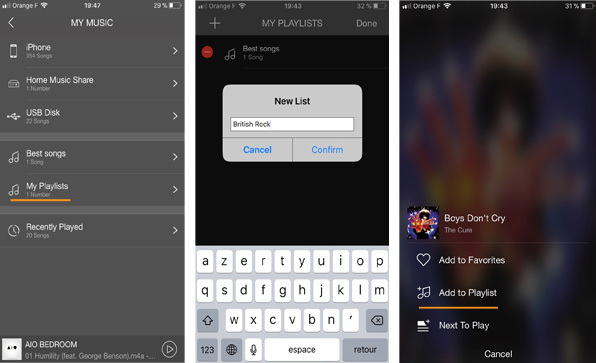 You can also make your own playlists : in the Playlist tab, select Edit, then the “+” button and name your playlist. As for your favorites, click on the “...” symbol next to your songs and select “Add to your playlist”. 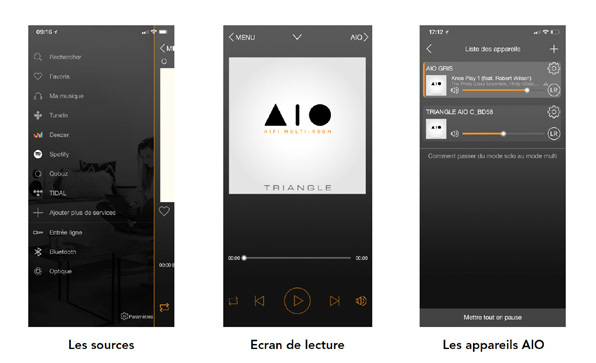 In addition to your local music, TRIANGLE AIO app gives you access to a wide range of streaming services. 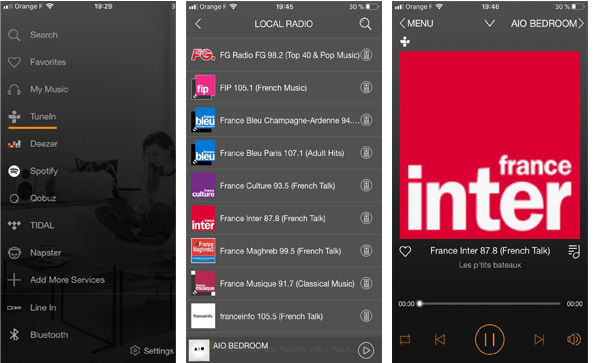 TuneIn gives you access to all the digital radios. 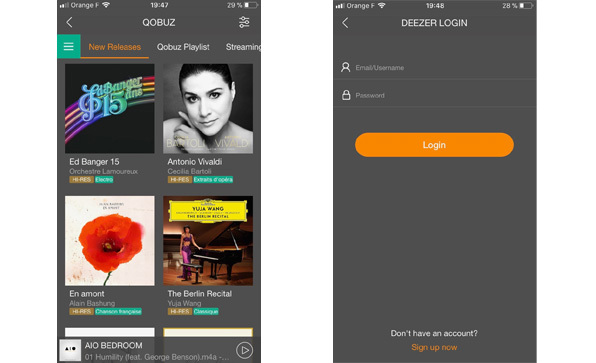 The streaming services Qobuz – Tidal - Deezer are available directly inside the application TRIANGLE. You need a subscription to access these services. 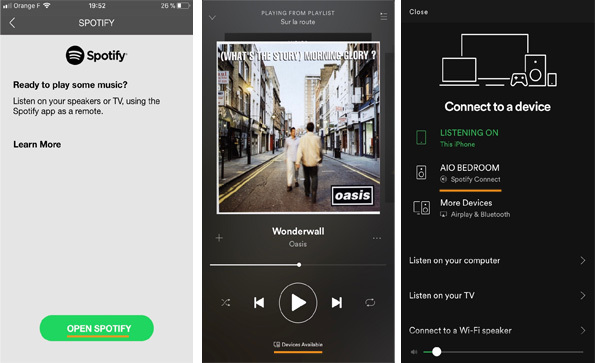 To benefit from Spotify Connect with your AIO, you will need to download the Spotify app and have a Premium subscription. Once selected, the Spotify app will start. 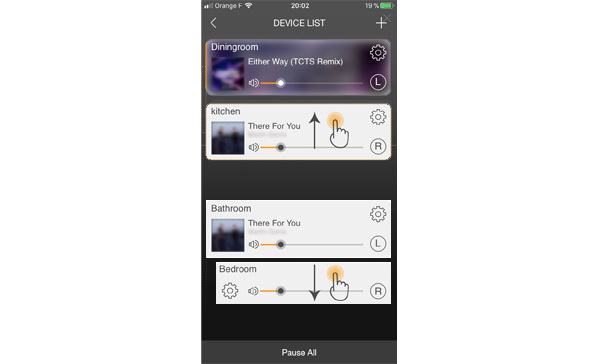 Choose a song, then click on “Devices available” at the bottom of your screen and select your AIO speaker. Your AIO3 is now a Spotify Connect speaker. 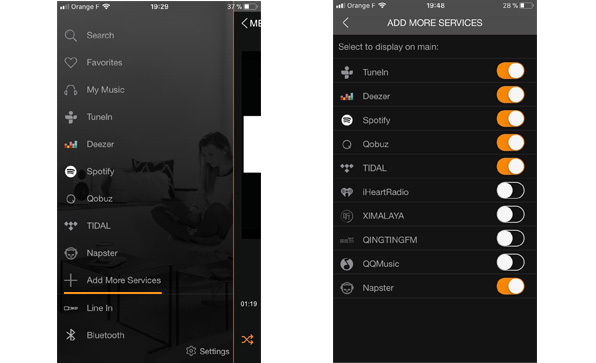 You can play your music directly from the Spotify app, without using the TRIANGLE AIO app. More streaming services are available on the app. Select “Add more services”, and choose the service you want to add, which will now be available on the menu. 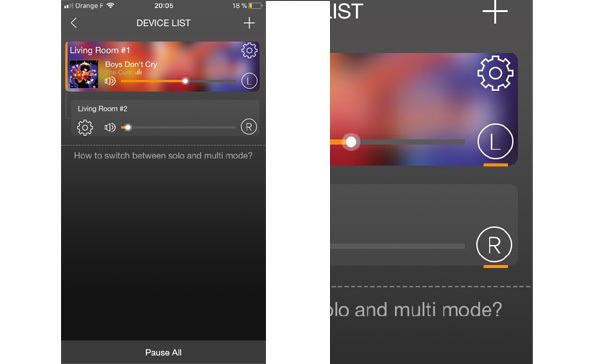 Control your music through the central panel of the app : Playback Screen. At the bottom you will find the usual Play/Pause, Previous and Next buttons. Add the current song to your favorites and access to the entire album through the icons located on each side of the song title. For fine adjustments, use the Volume button. We recommend using mostly this setting. 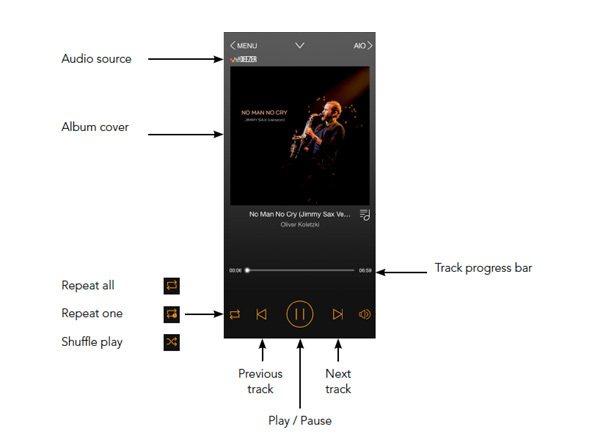 You can listen tracks one after another or set up a shuffle play, and also choose to repeat one song. The arrow in the top center of the screen allows you to return to the previous screen and your music selection. The tab on the far right of the application allows you to manage where your music is distributed. Select a speaker and return to the menu. Now all the actions performed will be applied to this one. The designated speaker will be highlighted in orange. You can go back to the tab at any time to select another speaker. You can broadcast different music in each room. Party Mode allows the same song to be played simultaneously by several AIOs. Associate a "slave" speaker by holding down with your finger and dragging it on the reference speaker. 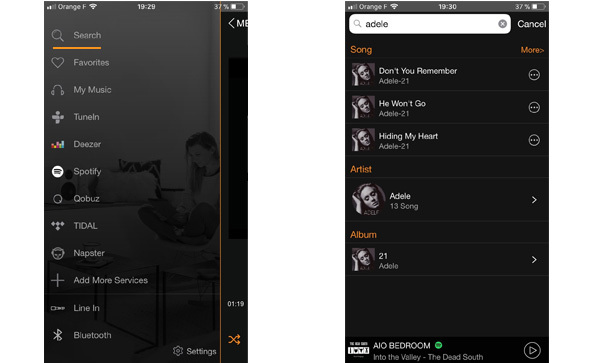 Now that both devices are linked to each other, you can change your music via the reference speaker. To break the speaker link, go back to the Solo mode and select the speaker and drag it outside the area marked by the dotted lines. Genuinely improve your listening experience with the Stereo Mode. For this, you must have two speakers present in the same room and positioned on both sides of you while listening. Pair the two speakers and define which will be the left speaker (L) and the right one (R) via the icon to the right of the volume bar. If you re-switch to Solo mode, do not forget to put the speaker back into stereo (LR). 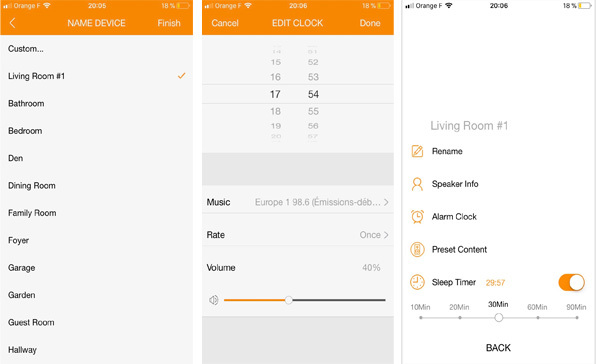 • Setting the alarm: choose the time, the music, the day of the week and the volume of the alarm. In order to ensure that the alarm works, leave your device turned on. • Set an Auto Power-Down after a certain amount of time. The sound stops but the device remains connected. You can also set up your AIO as an WiFi extender to cover areas that are out-of-reach by your router. 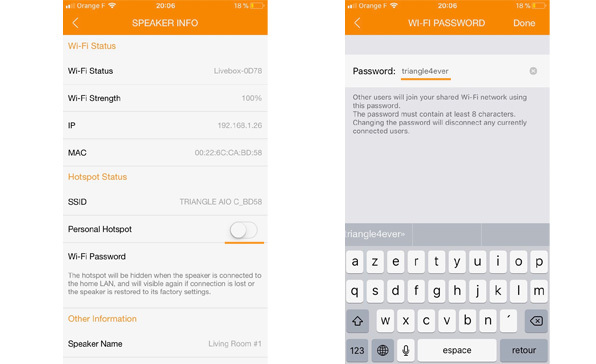 Go To « Speaker Info », activate the « Personal Hotspot» and enter a password. The AIO WiFi network is now available in your phone settings. Once you are connected you can access the internet or control your AIO through the app. To manage once again all your devices, return to you domestic WiFi network. 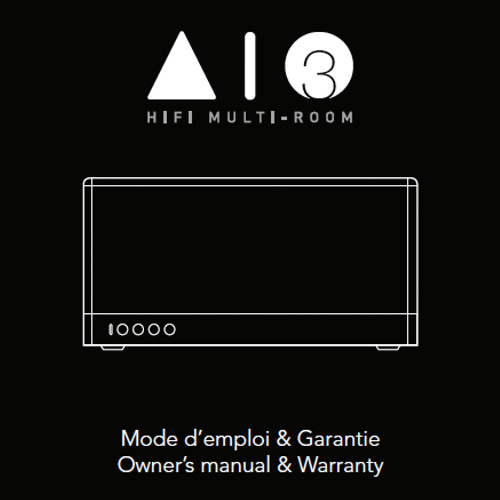 Download the AIO user manual for a complete product presentation and full installation process. Follow TRIANGLE’s latest news and special offers. You can also contact us directly by email or through social networks.